If you are a long-time reader of my blog, you’ll know that I am a bit of a scone addict. Scones are one of my favourite things to bake and eat. I love them because of how quick and easy they are to make. 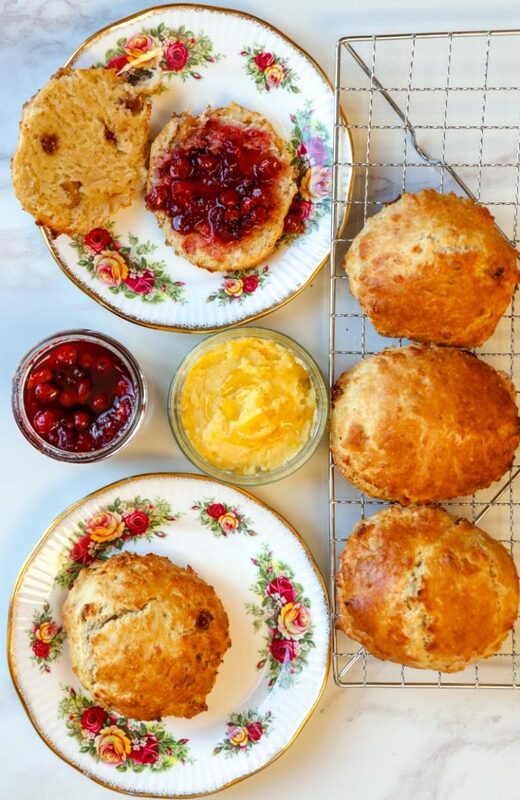 Once you have a fool-proof scones recipe you can easily adapt it to make any flavour of scones you like, sweet scones, fruit scones or savoury scones. This is one of those fool-proof, works every time, scones recipe. It has never let me down. This scones recipe consistently produces light and fluffy scones with a lovely colour and they also always perfectly rise. I have another scones recipe on my blog for baking fancy zesty lemon yoghurt scones. 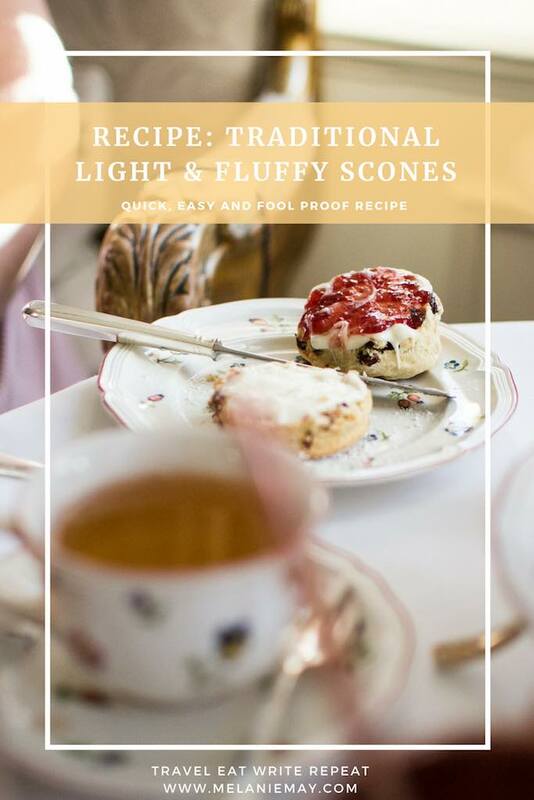 However, the scones recipe below is for your more classic, traditional British (technically Scottish) scones. You know, the type of scones you eat at afternoon tea and smother in honey butter, clotted cream and homemade jam and preserves. Delicious. A few months back, an Irish company called Forest Feast very kindly sent me some of its dried fruit snack packs to try. So, I decided to put some of the dried fruit in the scones. I used the Forest Feast figs and they worked a treat. You can use whatever fruit you like. Sultana scones are a classic, so too are currant scones but most dried fruit works well in scones. I am yet to find a recipe that works great with fresh fruit but when I do, I’ll put it up on the blog. Better yet, if you have a scones recipe that uses fresh fruit let me know about it in the comments. Lightly flour a baking sheet. Pre-heat oven to 220°C / 200°C fan assisted / 425°F / gas mark 7. Sift the flour, baking powder and a pinch of salt into a large bowl. Tip the cubes of butter into the same bowl and use your fingertips to rub the butter into the dry mixture until it resembles fine breadcrumbs. If you are using the honey or sugar, add it in now. Make a well in the centre and add 3/4 of the milk. Mix the dry mixture into the milk with a flat-bladed knife using a cutting action until the dough comes together in clumps. You can also mix the ingredients with your hands. If the dough is dry, add the remaining milk. The amount of liquid needed changes according to room temperature and even the altitude. The dough should be slightly wet and sticky. Unlike bread, scone dough just needs quick, light handling. If you are heavy-handed and mix too much the scones will be tough. So, handle with care. Once the dough has come together in the bowl, sprinkle some flour on your work surface and cover your hands in flour too before taking the dough out and putting it on the floured surface. Pat the dough into a smooth ball. Pat or gently roll the dough out until it is about 2cm (3/4 inch) thick. Don’t pat it too flat or the scones won’t have a good height. Whatever you choose to use to cut out your scones, dip into the flour beforehand. You can use a scone cutter or a glass or whatever works for you. Place each scone on the prepared baking tray. Lightly brush the tops of the scones with milk. Bake in the top half of the oven for 15 to 20 minutes or until risen and golden. When cooked, wrap the scones in a tea towel to keep them soft or, if you prefer your scones with a crisp top, place on a wire rack to cool slightly. I say slightly because scones are best served warm from the oven. Serve with cream or jam or honey butter. 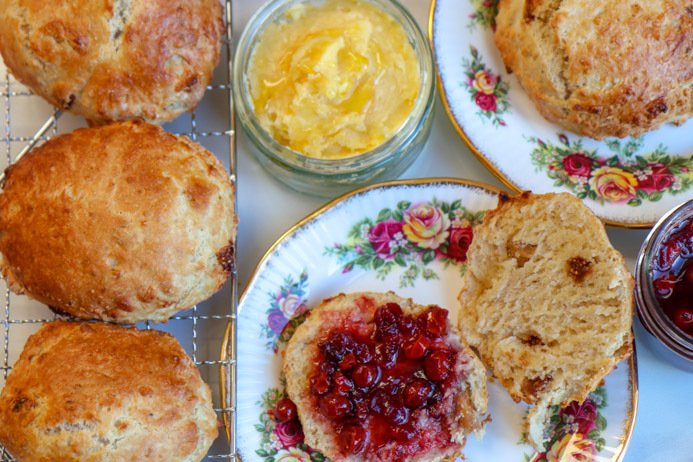 Honey butter is the greatest accompaniment for warm scones. 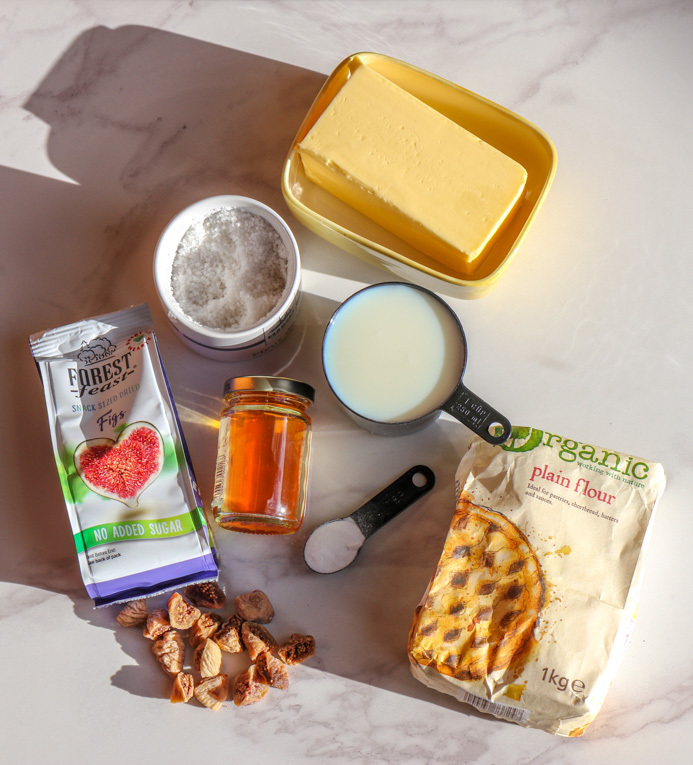 Click here to check out my super simple homemade honey butter recipe, but be warned, honey butter is highly addictive. Scones contain little fat, so they dry out quickly which means you should probably eat the batch in one sitting washed down with lots of tea whilst watching your favourite tv show or reading a really good book. Failing that, scones freeze well, but just make sure you wrap them up tight. So, what do you think of my Scones Recipe? Did you try it out? Did you like it? What improvements would you make? 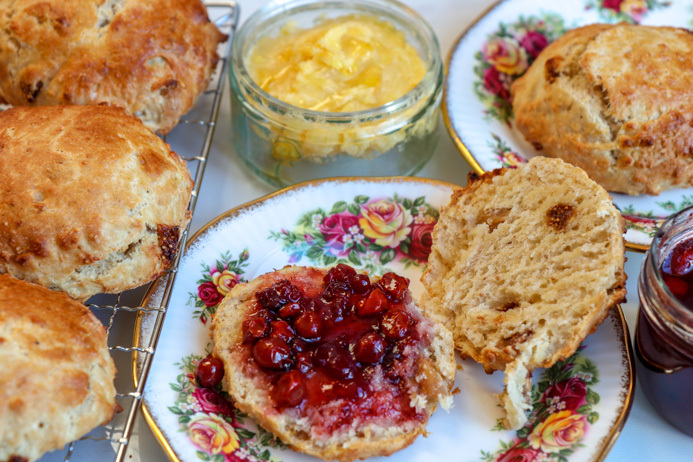 Share a photo of your own attempt at this scones recipe or leave any feedback and comments below, I’d love to hear from you. You have to make my honey butter recipe to smear on these scones. If you liked this scones recipe you might also like my fluffy American pancakes recipe. Or you might enjoy baking my glazed lemon and ricotta cookies, which are soft and like small scones. You might also like my recipe for lime and coconut macaroons. If you like this scones recipe, please share with others.